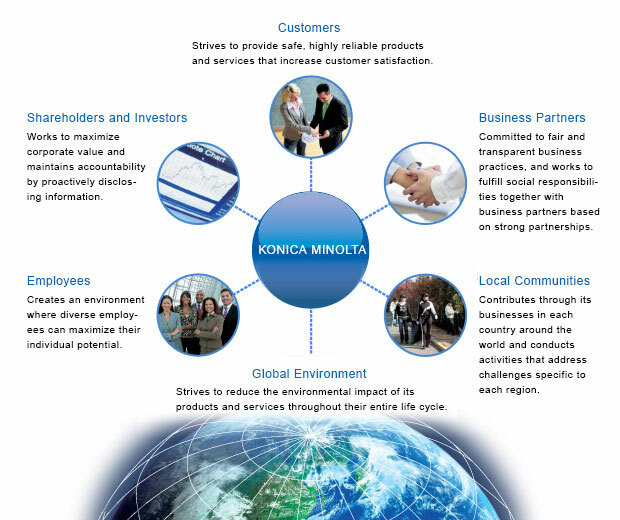 The Konica Minolta Group aims to be a corporate group that is both supported by and essential to society while continuing strong growth through the realization of its management philosophy, “The Creation of New Value.” In moving towards this goal, the Group hopes to contribute to the resolution of social issues by creating value that increases the quality of society through its business activities. The foundation of the Konica Minolta Group's corporate social responsibility (CSR) activities is this management philosophy and the Konica Minolta Group Charter of Corporate Behavior. To promote the understanding and practice of this charter, the Konica Minolta Group Guidance on the Charter of Corporate Behavior was created for all Group companies worldwide, reflecting the recommended behavior with respect to each item of the charter. The guidance stipulates that Group companies are to respect international social codes such as the UN Global Compact, to which Konica Minolta, Inc. is a signatory, and the Universal Declaration of Human Rights, and act in accordance with such principles. When setting key objectives for CSR activities, we worked to understand the areas where stakeholders have strong concerns and desires expressed by our stakeholders through various means of communication. In addition, we investigated international CSR-related requirements such as the Global Compact and ISO 26000. We furthermore collected and organized the risks and opportunities considered when deciding a business plan for each field. Based on the results of these, we have identified the issues deemed to have higher social priority and a greater impact on business, and made these key objectives for the Group.